Thanks to a handful of amateur cameraman we have a permanent record of the golden years of Britain's railways during the era of steam. This collection combines many of the finest images of the 'Iron Horse' that have been saved for posterity. Filmed in the 1950s and 1960s, all the footage is original archive material, in full colour and with soundtrack and commentary. The collection covers London, the Midlands, the North, the South West, Wales, Scotland and the Isle of Wight. 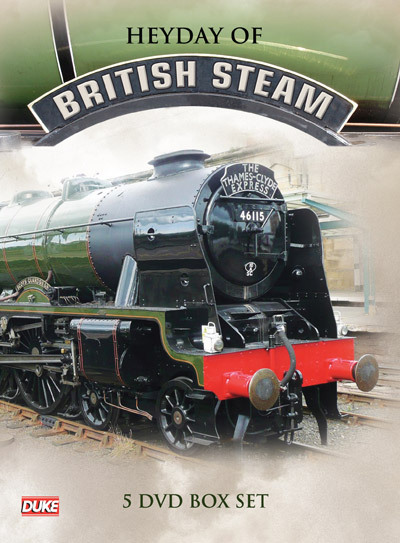 These film stake you on a journey to yesteryear, travelling some of the best-known and best-loved lines on famous locomotives, with all the wonderful sights and sounds of the golden era of steam.